As far as most people are concerned, cars have always had steering wheels; however, not so. The first internal combustion car ever made, the Patent Motorwagen designed by Karl Benz in 1885, was steered using a tiller bar. Tiller bar technology can be traced to boats, as they are often used to guide the direction they travel in water. Tillers work fine as far as moving the wheels in the direction you need them to go, but might become a nuisance with making wide turns - hitting oneself or passengers - and that may be the reason the steering wheel was developed within a decade of Benz's inventions. The first steering wheel appeared in 1894, on the French-made Panhard car designed by Alfred Vacheron and used in the famous Paris-Rouen race that year. The idea proved effective, and within four years, Panhard made them standard for their vehicles. Charles Rolls introduced them in his luxury vehicles the same year in Great Britain, as did Thomas Jeffery in his Ramblers. 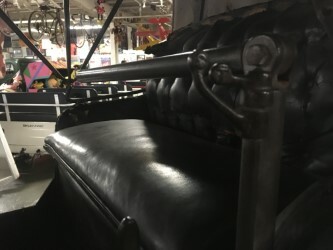 By 1904, all of Jeffery’s vehicles had steering wheels, and within a decade the tiller was almost completely abandoned. Simultaneously, American car owners started placing the wheel on the left-hand side of the car. That was in large part due to the decision Henry Ford made to locate it there, to nurture the rules of etiquette – forevermore, when an American car pulled up to a curb, the (often female) passenger got out of a car onto the safety of the sidewalk, while the (often male) driver dared passing traffic on the road side.